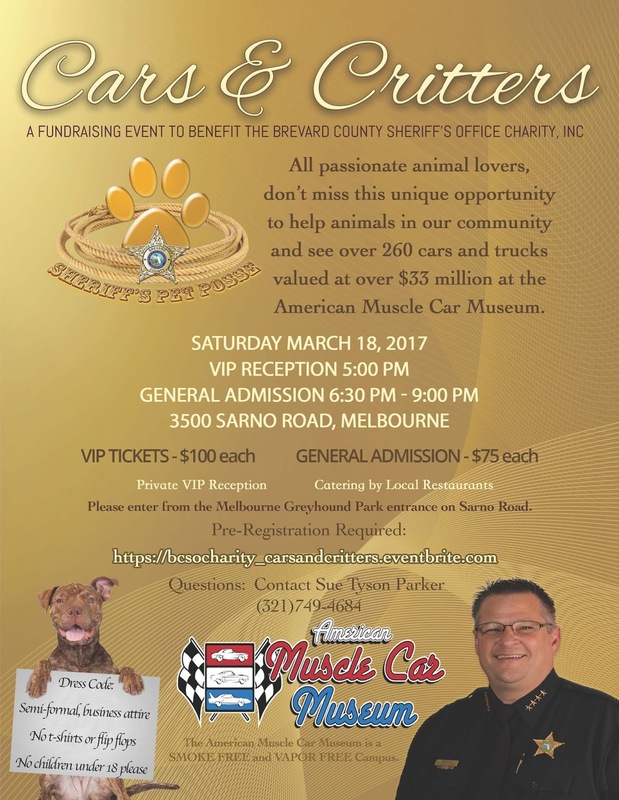 MELBOURNE, Florida - The Brevard County Sheriff's Pet Posse, a not-for-profit organization that supports the Brevard County Sheriff's Office Animal Care Center and other animal care partners throughout Brevard County, will hold a "Cars and Critters" fundraiser at the American Muscle Car Museum on Saturday, March 18, 2017. The American Muscle Car Museum is filled with hundreds of Muscle Cars that are all on display for your enjoyment. The museum is not open to the public but plays hosts each year to fundraisers for numerous local Brevard County charities. Join other members of our community for a fun-filled evening with food from your favorite local restaurants and a Live Auction. The American Muscle Car Museum is located at 3500 Sarno Road in Melbourne, Florida. Private VIP Reception starts at 5:00 p.m.
General Admission is from 6:30 p.m. until 9:00 p.m.
For more information and ticketing, visit Eventbrite.